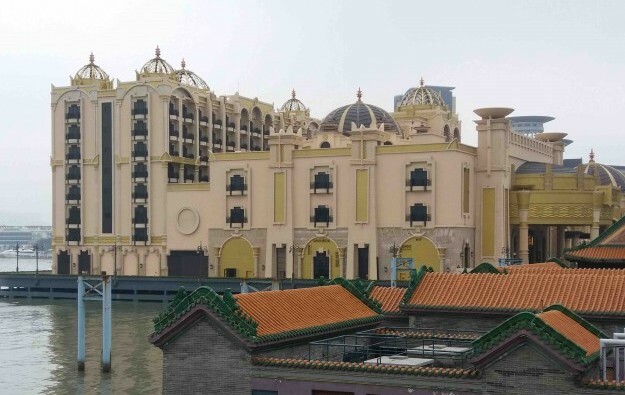 The casino and hotel at Legend Palace (pictured), a recently-opened Macau waterfront resort promoted by Hong Kong-listed casino services firm Macau Legend Development Ltd, remains closed 13 days after Typhoon Hato due to flooding, and might remain shuttered for some time longer, the company confirmed to GGRAsia in an email via a public relations agency. The firm gave no date for a reopening of the gaming at the facility, but mentioned, “focusing our efforts on the October 1 mainland Golden Week and the Grand Prix to catch up”. That was a reference to a holiday in China surrounding the country’s national day on October 1 that is typically a busy time for Macau casinos; and second to the Macau Grand Prix, an annual road circuit motorsport festival held in November, when hotels are typically fully occupied, including with non-gamblers. Macau Legend said the work needed to restart casino operations included “replacement from overseas” of some equipment and “possible insurance issues,” without giving further details. The Legend Palace Casino operates via the gaming licence of SJM Holdings Ltd. Separately, local public broadcaster TDM reported that two other casinos – Broadway Macau, promoted by Galaxy Entertainment Group Ltd; and Ponte 16, a venture between Success Universe Group Ltd and SJM Holdings, remain respectively closed and partially closed; while Mocha Inner Harbour – a slot club promoted by Macau casino licensee Melco Resorts and Entertainment Ltd – and located a short distance from Ponte 16, also remained shuttered. Macau Legend said in its email to GGRAsia that flooding at Legend Palace Casino was “immediately dealt with and damage to the interior was minimal”. The latter were references to, respectively, Babylon Casino, another gaming facility at the firm’s Macau Fisherman’s Wharf complex, and Pharaoh’s Palace Casino at the company’s Landmark Macau hotel also on Macau peninsula. The email did not give a specific date on which the normal operations of Legend Palace will resume. Frederick Yip Wing Fat, a Macau Legend casino executive, was quoted by TDM as saying water invaded the basement at Legend Palace, reaching as high as 1.5 metres (5 feet), and damaged essential equipment such as Internet servers and air conditioning machinery. Mr Yip was further quoted saying it might take months to buy and reinstall all equipment and appliances, but that Legend Palace was likely to reopen around September 23. Typhoon Hato struck Macau on August 23 with wind speeds of more than 200 kilometres per hour (124 mph) according to the local weather bureau. Several local casino resorts were damaged and had temporarily to suspend their operations due to cuts to power and water supplies. Legend Palace is the third hotel at Fisherman’s Wharf. The second, Harbourview, opened in February 2015 but does not have gaming. The first hotel, The Rocks, also does not have gaming. In its 2017 interim report, Macau Legend said that a fourth planned property at Fisherman’s Wharf – the Legendale Hotel – was undergoing redesign “to meet the height requirements of the relevant government authority in Macau”. Some gaming tables had been moved to upper floors, to allow some gambling business to continue in the meantime, Mr Ma was quoted as saying. Several investment analysts have estimated that Macau lost approximately 6 percentage points of growth to casino gross gaming revenue in August as a result of the typhoon. Macau casino GGR rose by 20.4 percent year-on-year in August, to nearly MOP22.68 billion (US$2.81 billion), according to data from the city’s Gaming Inspection and Coordination Bureau, released on Friday.